Canning Ring Pumpkins - A Craft Project! I am really excited about today's post. I know, it isn't my usual recipe post, but it is a cool and easy craft post. And since I've been asked to do more craft posts, I thought this would be perfect. 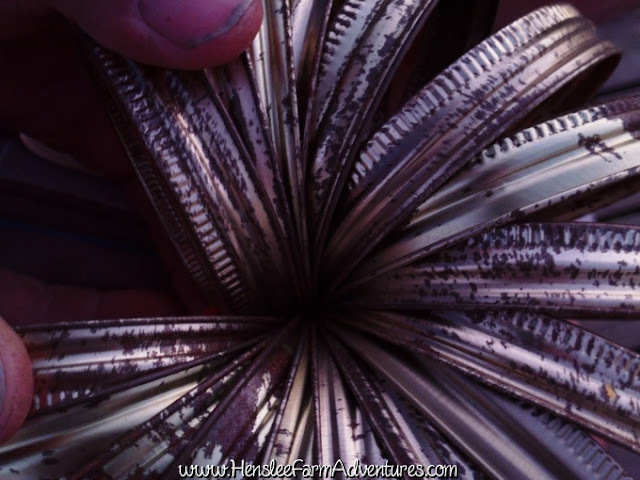 I have seen something similar to this on Pinterest, and last night my sister texted me a picture of canning rings put together like this, but decorated for Christmas. She said she thought it would be cute and I should do one for my blog. I thought, hey why not? 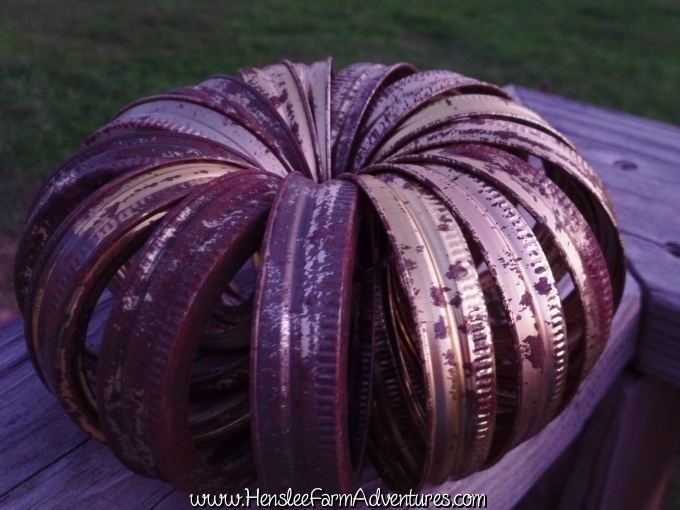 The best part about this craft is that it cost me a whopping $0.10 per pumpkin to make. The only thing that cost were the decorative leaves and the zip ties. We actually already had the zip ties, but I thought I would go ahead and throw in their cost as well. 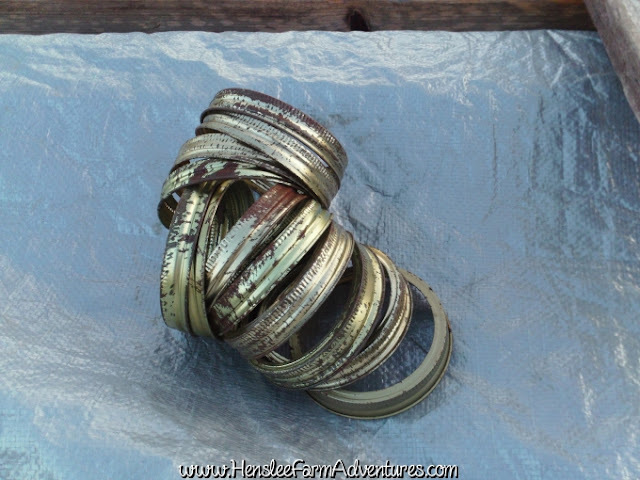 What helped with the cost was getting canning rings from my parents. I had a feeling that they might have some and boy did I hit the jackpot. What I love about them is that they are rusty and old looking. But it wasn't my intention to leave them that way. 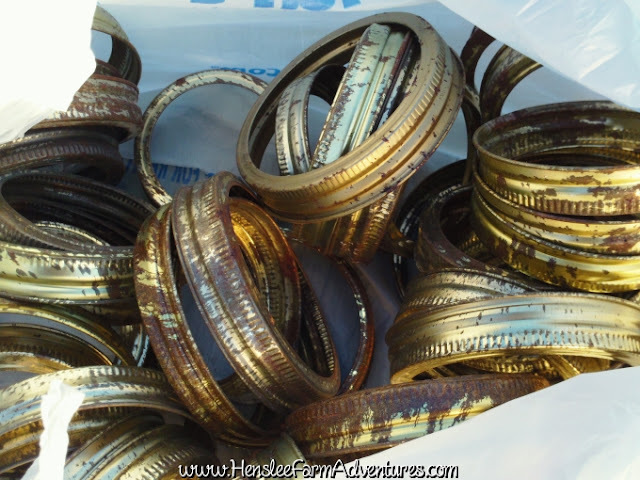 Bag full of wide mouth and regular mouth canning rings. My plan was to spray paint the rings orange, in fact I had orange spray paint that I had bought for another project, but after I got home I realized that it had been used on a pine wood derby car. So I looked through my spray paint, and decided to paint them a brown color. My wonderful hubby helping out! I thought that the brown would work and I really didn't want to have to wait another day, or spend more money on this. I really wanted to be able to use what I had at home. 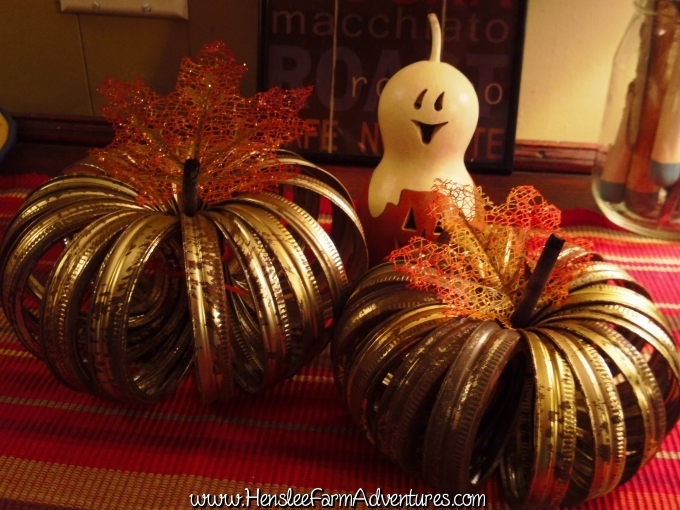 One thing I did purchase, was a bag of sparkly decorative leaves from the local Dollar Tree that I thought would go perfect as part of the decoration on the pumpkins. After spray painting the rings, I started looking at the ones we had left. And I kind of liked the way they looked. Steve talked me into making one with the rings as is. That is when he took over the project and let me snap some pics. It was kind of nice for a change! He made both a wide mouth sized pumpkin and a regular mouth sized pumpkin. For the wide mouth size you will need between 18-20 rings. 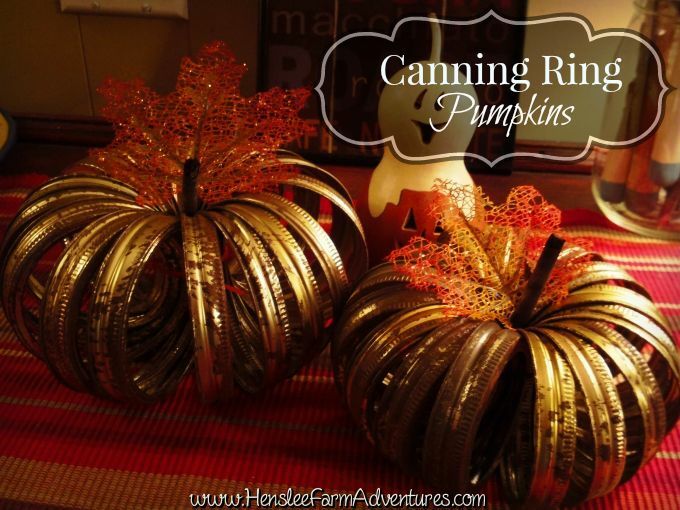 For the regular mouth sized pumpkin you will need 15 rings. You will want to put the rings together like the picture above. Don't try to fan them out yet. That will come later. Once you have them together, the best thing to hold them is a zip tie. 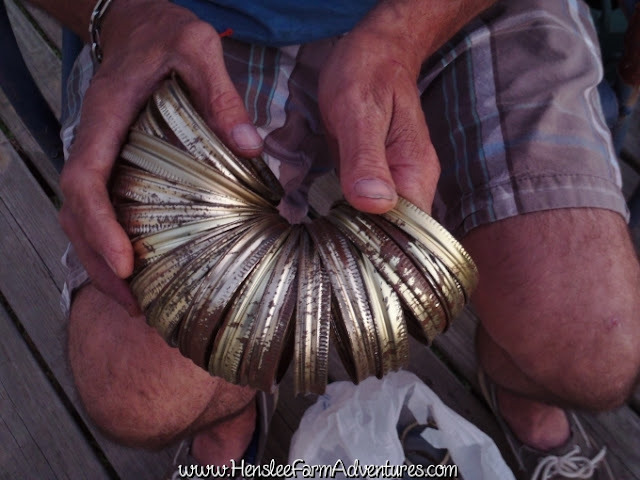 Steve used two zip ties to make it large enough to go through all the rings. You will need a pretty long zip tie. 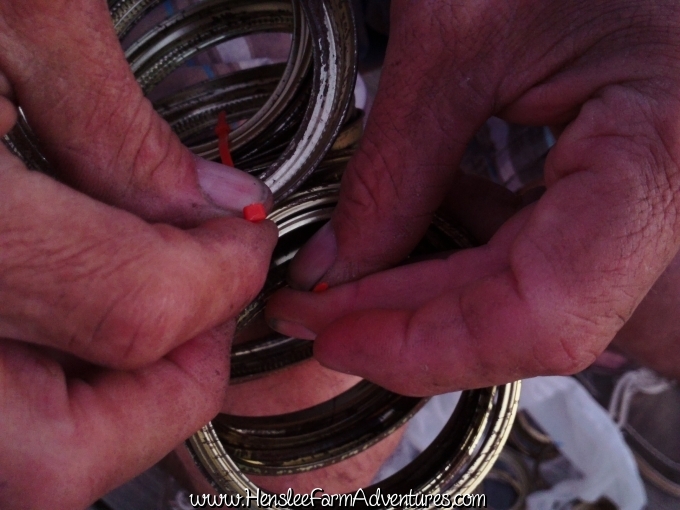 Once you have the zip tie in place, you will need to work with the rings and get them to interlock with each other. You may need to also adjust the zip tie and pull it tighter as you are interlocking and fanning out the rings. Once you get it the way you want, then you should have a beautiful pumpkin shape. My soon to be pumpkin. I believe the one that I saw on Pinterest used a cinnamon stick for the pumpkin stem. I looked through my cabinets and didn't find any cinnamon sticks, so again Steve came to my rescue and found me some actual sticks from our yard that I used as the stem. 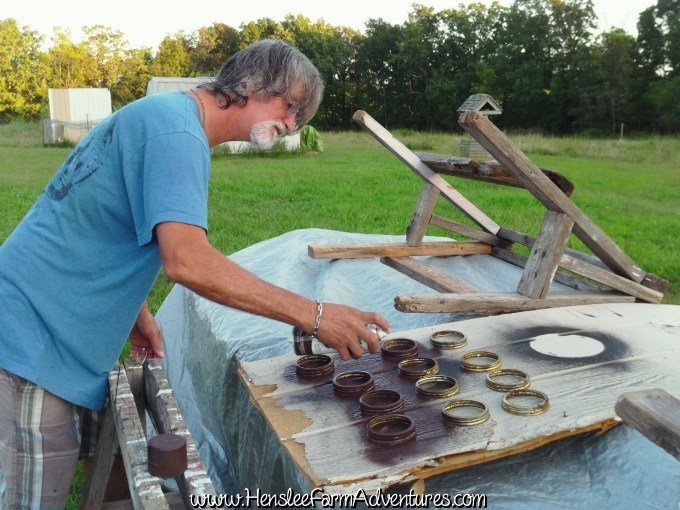 I believe that I actually like the use of a real stick which adds to the rustic look of the rings. I also added in one of the sparkly leaves for color and voila! After making these and leaving the rings as is, I really like them. In fact I think that I like them better than the painted ones. I actually haven't made a painted one yet, but I will just to see. I also love that these are old and rusty and antique looking. I think that they are perfect! So comment below and let me know what you think about this easy and cute craft. Throw Back Thursday: Our Anniversary! We Put the Labor in Labor Day! Happy No Rhyme (Nor Reason) Day!